Ok, who isn’t sick of the cold yet?! If I could get my hands on that ground hog…well, as an animal lover I guess I have to let some things go. Just gives us more time to enjoy hearty, warm, and comforting foods. 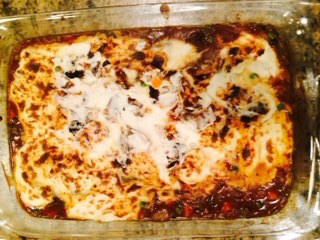 Here’s my take on Fast Shepherd’s Pie from Cooking Light. I’ve taken this fast recipe and made it a tad bit faster. The only downside I have found is that it may be a bit more “saucy,” but can we say clean plates by all?? That = A KEEPER recipe in my book. Total Time: Under 1 hour. *I just ask the butcher in my grocery store to cut the meat from the bones so it makes it easier to cut them in smaller pieces at home. I also suggest using 8 chops for a more meaty taste. **/*** : These are the items I use to speed things up even more. The original recipe calls for microwaving baby carrots, slicing them up and for making frozen Ore Ida Steam n’ Mash potatoes. Heat a Dutch oven over medium-high heat. Add oil to pan; swirl to coat. Sprinkle lamb evenly with salt and pepper. Add lamb to pan; saute for about 4 minutes, turning to brown on all sides. Remove lamb from pan with a slotted spoon. Add onion to pan; saute for about 4 minutes and stir occasionally. Stir tomato paste into onions in pan; cook 1 minute, stirring frequently. Add wine; cook 2 minutes or until liquid almost evaporates, scraping pan to loosen browned bits. Add flour; cook 1 minute, stirring constantly. Gradually add broth, stirring constantly. Stir in carrots, peas, thyme, and rosemary. Bring to a boil; cook 4 minutes or until slightly thick, stirring occasionally. Remove from heat; stir in browned lamb. Add butter to Bob Evans Mashed Potatoes and microwave for just the first cooking cycle. Spoon lamb mixture into a 2-quart broiler-safe glass or ceramic baking dish. Top with Bob Evans Mashed Potatoes. Broil 4 minutes or until lightly browned.